On Friday 17th October, we ran our annual Night Hike for the Scouts. This year, because Simon was unfortunately ill, he had to leave early and so it was left to leaders from another group, helpers from Bath 'BUGS' SSAGO, the Young Leaders and I to run the hike. This year we resumed to the Skyline route, and although only one patrol was able to complete the full 18 miles before it go too late to carry on, both the other patrols got very close with minimal drop-outs. Overall the hike was a success and the Scouts benefited from practising their navigation skills prior to this. 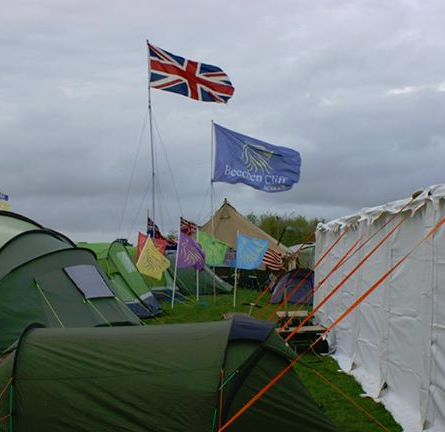 In September, I attended 'Intense' for the first time, which is a national camp for Network Scouts (18-25), run at Woodhouse Park just outside Bristol. The Saturday is spent doing activities such as segways, laser quest and playing on giant inflatables, and on Sunday the infamous 'piano bash' takes place. At Woodhouse Park Scout Activity Centre near Bristol last weekend, over 250 Network members tackled a massive variety of activities, including the aerial runway, water bungee slide, leap of faith and crate stacking. In the annual piano bash, an legendary tradition at Intense, participants raced to dismantle old pianos and post the pieces through a letterbox. The evening programme was just as busy, with discos, a foam party and a traditional campfire keeping everyone entertained. Intense is just one of many opportunities for 18-25 year olds in Bath and the surrounding area. If you would like to join them in further adventures contact them here! Between the 14th and 24th August, I went along with Bathampton Scouts for our annual summer camp, which this year too place just outside Sway, in Hampshire. Throughout the camp, the Scouts wrote a blog with what they did each day which is available at blog.bathamptonscouts.org. Scouts from Bathampton have just returned from their yearly summer camp in Sway on the edge of the New Forrest. The intrepid Scouts took part in their annual Top Gear Challenge that involves them identifying land marks from photos and using any transport method. This year saw the 30 Scouts walk from Sway to the local station and then catch a train to Portsmouth. From here they took a ferry to Ryde on the Isle of Wight. The Scouts then caught a bus to Sandown Pier on the other side of the Island, had an ice cream and free time on the beach. They then caught a bus to Yarmouth, a ferry to Lymington and from here they walked back to Sway. The Challenge was won by Kestrels who achieved the exercise in the shortest time and used the least amount of money! Other highlights of the camp included hiking through the New Forrest for their Expedition Challenge badge, a 24 hour survival exercise for their Survival Badge, a Christmas party complete with music, Christmas games and crackers. Archery, Dutch Arrows, zorbing, sea kayaking at Lymington Sea Pool, a visit to a music concert in Bournemouth and a sandcastle building competition on New Milton beach (won by the Merlins) and a quiz in Lymington. All of the Scouts slept under canvas, cooked on wood fires and built their own camp gadgets including dressers to help make camp life easier. The camp competition; where points are awarded for cooking, Scout craft, Top Gear Challenge, sandcastle building and the quiz was won overall by the Kestrels led by Melissa whose Patrol was awarded the Spadger Trophy. For more information about what we got up to on camp, please visit our day by day camp blog at blog.bathamptonscouts.org. Between the 4th and 6th of July, for the second year, I spent the weekend helping with Beechen Cliff's Centurion Challenge where I was part of the cycle support team, working with Mr Brewer. Over the course of the event, I managed almost 200 miles from going up and down the group of walkers. The Beechen Cliff School Centurion Challenge 2014 has take place. 61 boys in years aged 12 to 17 took this year’s challenge and making history was one young woman, Caitlin Beddoe in the lower sixth. The start at 4 o’clock on the Friday was in slowly greying sky’s and there was a fine drizzle on the way to the Devizes Camp Site, but with 3 hours the numbers had reduced by 2. Most arrived at 9 o’clock, feasted on the awaiting BBQ before retiring fort the night. Only to be woken at 5 o’clock for the start one hour later, just as the nights torrential rain had ceased. The magnificent 60 now made their way to St Lawrence Church, Hungerford, the 50 miles half way point and were welcomed by the Reverend Andrew Sawyer. Resting only for 15 minutes, the challengers feasted on the buffet of rolls, cake, fruit and energy bars before returning along the same canal tow path. 10 challengers were to fall here and on the long 27 miles journey back to the Devizes encampment. On the final morning 49 challengers set off to return to the school by 4 o’clock to qualify as Centurions. The first 3 ; Matthew Wedding, Joseph Grosvenor and Ethan Foster, covered the final 23 miles in just over 4 and a half hours and will have their names engraved into the Centurion Challenge Hall of Fame. The others followed in the hot sun and were greeted by friends and family to be hailed as Centurions. The charity we adopted t for this year’s challenge and our Three Peaks Challenge was Ethiopiad. Their aims are simple. They provide breakfast and schooling for the hundreds of children living on the streets of Addis Ababa - in partnership with Hope Enterprises. A nourishing breakfast provides the incentive for these children to attend informal classes in basic literacy and numeracy. By removing the constant pressure to find money for food, the children are given time to learn and gain the skills necessary for a better start in life. The 2014 Centurions agreed that this was a noble cause and worth the pain to raise sponsorship for. - in theory to be my last as a 'challenger'. Having taken a break from Ten Tors in 2013 due to a very busy exam schedule this weekend I would be going for the gold, 55 mile, route. On the Friday we met at Bearflat shortly after 7am, departing via Norton Hill and Exeter services, to Okehampton Camp. We arrived mid morning and followed Mr Brewer to our site which was as always marked by the tallest, and widest selection of flags. At the site I met up with Tom and Rob who had gone down the day before, along with most of the staff to set up the site. The routes had been released while we were on the coach so when we arrived we discovered we had been allocated route 'X'. All the routes were different this year as part of the army responding to budget cuts, so rather than taking us to Trowlesworthy Tor at the bottom of the South Moor, our route's most southerly point was 'Peat Cot', the new most southerly point of all routes, and as such there would be far more zigzagging across the moor. Nobody knew how much easier or harder the routes would be as a result of this, and how this would affect our timings. We then went to our tent, and had our kit checked before going up to the scrutineering. We went up to with the 35 and 45 teams and made fun of Rob who wasn't very happy he'd been asked to be the 6th member of one of the 35 teams (he did get a Rab soft-shell out of it though so couldn't complain in the end). Scrutineering took place without any problems, as did the briefing which followed. Once we'd had both of these stamped on our route card, we went back to the site for lunch and to plan our route. After this, there was just time to cram in some revision before dinner and an early-ish night. The next morning we awoke to the classic 'chariots of fire' over the camp tannoy as quickly packed up our things. 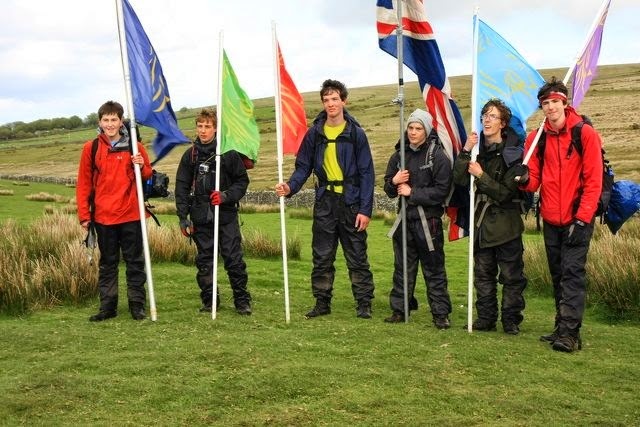 Once we'd had our breakfast we were lined up for a series of photos in front of our display of flags, and then quickly made our way to the start point at Anthony Stile. We took our place next to the big 'X' sign and waited for the guns to go off to start the challenge. Our first tor was Great Kneeset however because of the new routes, we first had to go via Nodden Gate on the west edge of the moor. This involved us crossing the West Okement River and curving passed Sourton Tor and then joining the discussed railway line to the gate. After checking in, we quickly turned around and headed east, passed Great Links Tor and Green Tor before reaching Great Kneeset. After a brief stop, we continued on, joining the track below Okement Hill and then cutting across east to Watern Tor. Following Watern Tor we then had another 'via' to go to at Fernworthy on the western point of the Fernworth Forest. This was a fairly short leg across boggy ground however we had to wait just before checkpoint as a member of the team running the base ran towards us and got us to wait while one of the three helicopters which support the event picked up somebody who had hurt their leg and couldn't walk on. We didn't stop any longer than the amount of time it took to check in at Fernworthy because we had already had a break waiting for the helicopter. We then made our way around the north edge of Fernworthy Forest, cutting up north east to our third tor, Kes Tor. From there, we walked south, on the eastern edge of the Fernworthy Reservoir, heading due south to Water Hill as the weather took a turn for the worse. The weather was at its worst point for the whole weekend while we were at Water Hill - one of the most exposed points on our route - so we only stopped briefly before heading down into Postbridge. The field behind the car park in Postbridge where the army had made their base had become a quagmire as a result of every single route passing through this bottle neck, as had most of the paths in and out. We stayed just long enough to see one of our 35 teams and then headed up a slippery track full of teams back onto the moorland. From head we headed north west towards Rough Tor. By this point some members of the team were starting to struggle so we had a brief break halfway between Postbridge and Rough Tor. Shortly after moving off again, I noticed the tracker that the army supplied us with was beeping, and when I took it out of my bag, saw the emergency button must have been activated (I don't know how this happened because it was still in its sealed case), the screen said 'are you in danger'. The only option the device gave me to respond with was 'Yes', so because we were now just at the bottom of Rough Tor we though the best option would be to explain the problem to the team there. As we approached Rough Tor we were asked who were, and when responded with 'x-ray alpha', we were told that I, as team leader, had to go with the tor leader and phone Ten Tors HQ because our tracker had been activated and the tor party had been put on alert to look out for us. Once it had been cleared up that we hadn't activated the tracker and were all ok, we checked in and left, just as a helicopter arrived at the checkpoint to help find us! On the next leg we walked passed Beardown Tors (although this wasn't one of our checkpoints), passed Beardown Farm and onto the South Moor. It was getting close to the 8pm cut off time by this point and we didn't want to be stuck at our most southerly point, Peat Cot, overnight so really picked up the pace, overtaking a few other 55 teams on our route as we did so. We got to Peat Cot at 7.55pm giving us 5 minutes spare to check in before we were allowed to walk on. We headed up the 'yellow brick motorway' until South Hessary Tor where we curved off to the West. We crossed the B3212 as it was starting to get dark and the weather started to turn again. We preceded to follow the old railway track west and then north to the disused quarry next to Yellowmeade Farm were we decided to stop for the night. We tried (unsuccessfully) to find a sheltered spot for our tents and promptly went to bed. The next morning we managed to oversleep - we'd meant to get up around 4am, giving us two hours to pack up and make our way to our next tor for when checkpoints open at 6am. Unfortunately, we didn't wake up until 5am so despite getting our kit packed in record time, we didn't make it to our 7th tor, Middle Staple Tor' until 6.55am. Fortunately, because we'd managed to get passed Peat Cot on Saturday evening we were still in the top half of the team on our route and we made up lots of time by powering through the next section to Standon Farm. By this point we were the fourth team on our route (out of 12), behind QEH, who were over an hour ahead on the team in second, Great Torrington Adventure Group, and Norton Hill who we arrive at Standon Farm just one minute behind. We left Standon Farm and headed passed Lane End going north west and ticking off Ger Tor and Hare Tor as we passed them before arriving at Chat Tor, our 9th. Norton Hill had taken a slightly different route from us for this leg but we both arrived at Chat at exactly the same time! 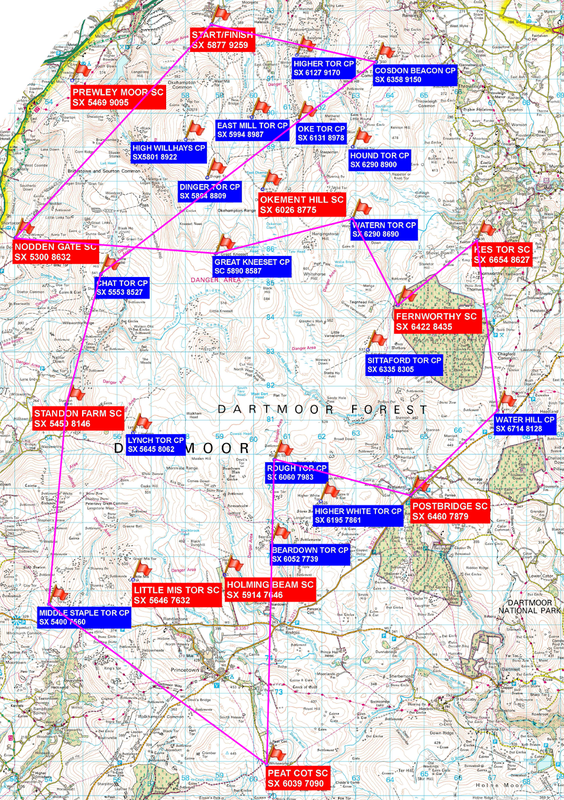 Our penultimate leg was the longest and by far the hardest of the challenge, from Chat we had to Cosdon Beacon on the east side of the moor, overshooting the finish line at Okehampton Camp. To do this, we first went north west to Kitty Tor where we dropped down the steep valley to cross at Sandy Ford. I managed to hurt my knee on the steep descent which made the steep climb on the other side even harder. We hit a track just north of Dinger Tor and followed this east and then north until we were just south of Higher Tor. From here we left tracks and went east over the River Taw and up Cosdon Beacon. We'd managed to overtake Norton Hill on the long leg so were now the third team. We took a slightly longer break than usual before descending again, down around Higher Tor, passed Cullever Steps and up the track there until we could see the camp. At this point we met Mr Stuart and Mr Sayers who gave us each a flag which we carried, running the last few metres across the finish line into the camp at 3.50pm. almost deliberate timing low pressure with rain and gales gathered over the Atlantic to take great delight in blasting Dartmoor from Thursday to Sunday morning over last weekend. brilliantly over the weekend and won out in due course. 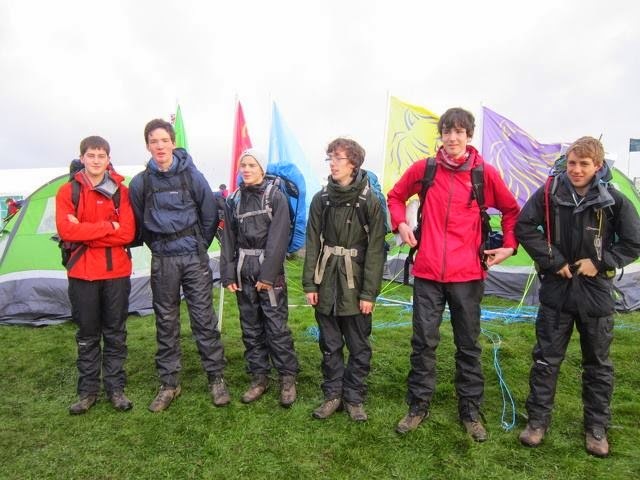 Once again we had teams walking at all distances, 35 miles, 45 miles and 55 miles respectively. Training began in January as this is not the sort of event where you can ‘just turn up’. The ante is progressively upped with day walks on the Mendips and Quantocks turning into more arduous weekend expeditions over Dartmoor. As ever the teams have to become self-sufficient, able to spend a night out on the moor and navigate across no matter what conditions. 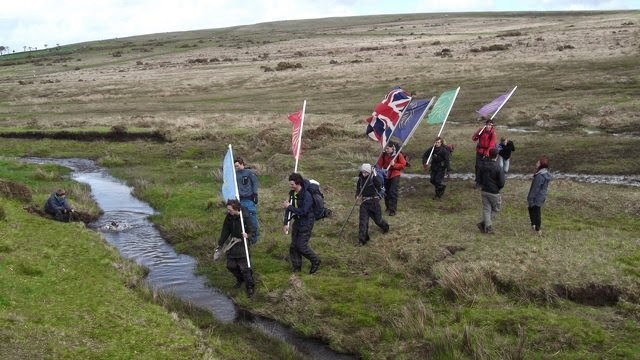 In this way they visit their Ten Tors. 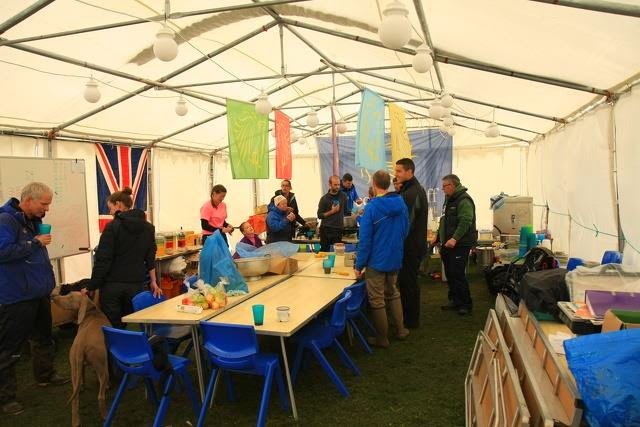 Okehampton Camp high on the moor was our exposed base for the weekend where teams from all over the South West converge for the mass start at 7.00am Saturday morning. This means that the place fills up over Friday as kit checks and briefings are conducted by the Army. Teams also see their respective routes for the first time and have to plan their tactics and approach. The atmosphere builds in this tent city which even boasted a 200 person strong ‘conga’ line at one stage, weaving its way around tents and portaloos. set of medals, topping Bronze and Silver medals with a coveted and prestigious Gold. Special mention must be made here to Harry Jenkins who walked with another 55 team (Norton Hill School). Without him and his training and ability to complete this most demanding of distances they would not have been able to start the event as teams of six are needed. Well done Harry! 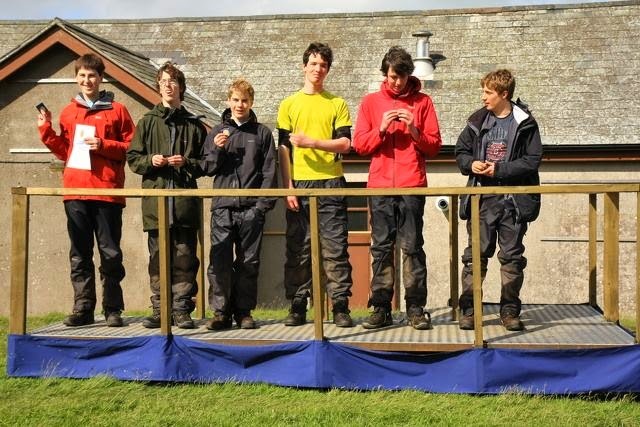 Ten Tors is a firmly fixed event on the Beechen Cliff calendar and is recognised nationally as the premier youth challenge event of its kind. 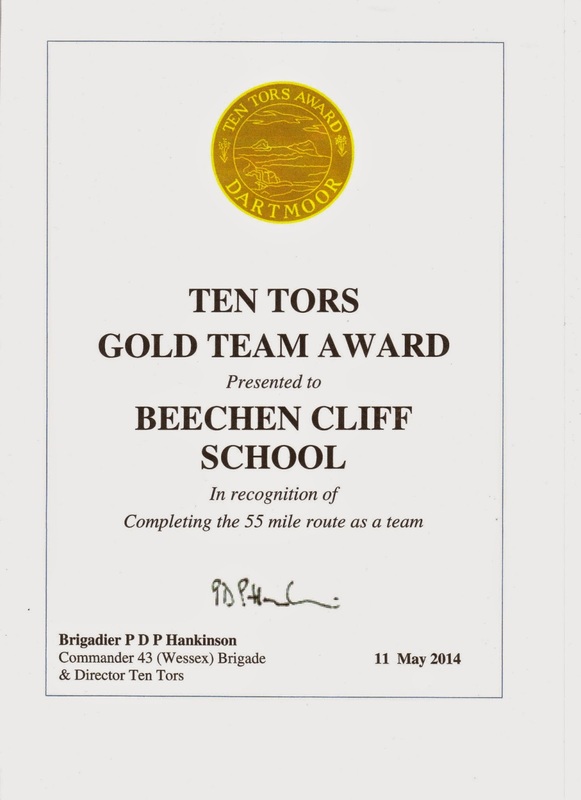 I am sure pupils would want to acknowledge the huge input and hours given up by staff at Beechen Cliff of whom seven have been regularly involved in preparing groups for the event. Completing Ten Tors is a huge achievement and the scale of the event has to be seen to be believed. On this note it was greatly appreciated by staff that so many parents came down to witness the finish and understand what all the efforts have been for. Here’s to Ten Tors 2015. On Friday 25th April we went down to Dartmoor for the final Ten Tors training weekend before the event itself in two weeks time. After the usual stop at Exeter services, we went to South Zeal for our kit check, route planning and bed. Early the next morning we drove to Okehampton Camp and met the 55 team from Norton Hill School. As they had 5 people wanting to complete 55 and we had 7, one of our team would be joining then for the event and we would be walking with them for some of the time this weekend. We then promptly headed off, reaching our first checkpoint at Cullever Steps just after it started to rain. We then headed south passed Oke Tor as the weather continued to deteriate, and on to Waters Tor. The weather then started to improve as we cut across east to Kes Tor and held out until we reached Fernworthy when it started to get worse again. We then made our way to Sittaford Tor and continued to complete the long leg over to Water Hill and then back down into Postbridge. At this point, we met Mr Brewer and, as we were ahead of schedule, continued on through Postbridge and up to Bellever Tor, meeting the staff and minibus at the road on the other side of the Tor. We were then told that so we got to know the 55 team from Norton Hill we would be camping with them at the campsite which the staff use in Princetown and so, for the first time, would not be wild camping. The Norton Hill team were still walking (we had the same route as them but had overtaken them at Cullever Steps), so we ate and set-up our tents while it was dry and were just about to go to bed when the Norton Hill team arrived. We went and sat in their minibus for a while and found out that they were planning on sleeping in the bus overnight rather than in tents, and then went to bed. The next morning after breakfast and collapsing our tents down, we set off again, this time heading our south, towards South Hessary Tor and Peat Cot where we almost doubled back on ourselves and headed towards Two Bridges. Once there, we headed up the path through Beardown Farm to Beardown Tors where we met Mr Stuart and his drone. We then headed down the valley with the intention of crossing it at the bottom, but hight river levels from all the rain we had had the day before made this much more difficult that we'd expected and delayed us slightly. Eventually we did find a way across and headed up to, and passed Higher White Tor before walking around the boundary wall north west of Postbridge where we were able to find the footpath in to Postbridge, at the end of which we waited for the staff and other teams to arrive just as it started to rain. Having missed the first Ten Tors training session of the year on Dartmoor earlier in the month, this was my first visit to Dartmoor in 2014. We drove down on the evening of Friday 28th and after a brief stop at Exeter services as usual, we arrived at the hall in South Zeal and had our kit checked before planning our routes for the next two days. Early the next morning we drove to Okehampton Camp and promptly headed off into the fog surrounding Yes Tor, once there heading back down and over the West Okement River to Sourton. We then headed south along once of the well established tracks to Great Links Tor, before heading down off the moor via Chat Tor, and to the right of Sharp Tor and Hare Tor to the Lane End car park. We then followed the road and paths to a footbridge over the Tavy, and then continued passed Standon Farm up to the top of Lynch Tor. After this we did the dreaded walk east to Baredown Tors, and then back, west to Little Mis Tor where we briefly met some of the staff. Following the poor advise of an ex-student who was helping, we then headed straight down the side of the valley and eventually managed to cross the river at the bottom and traverse the two barbed wire fences on some very boggy ground in which I went up to my waste, allowing us a supposedly quicker route to Great Staple Tor. Our final checkpoint of the day was, as usual, Black Tor, so to get there we headed down off Staple, crossed the road, and followed the dismantlement railway for most of the way before crossing a small area of open more to our campsite. Once there, we met Mr Brewer and other members of staff who brought us away from our normal spot down to next to the Devonport Leat before leaving us to have our dinner and go to bed. The next morning, after having breakfast and backing away our tents and kit, we headed north to North Hessary Tor and then followed the pass down one side, into Pricetown and passed the Plume and Feathers where the staff had been staying. After a quick chat with Mr Brewer we sped down the 'yellow brick motorway' to the Whiteworks at Peat Cot before going east and then north to the Prince Hall Hotel. Once there we crossed over the road and went up Bellever Tor where we met Mr Stuart and Mr Mason before descending the other side into Postbrige where we finished. ©Ethan Rose - www.ethanrose.me.uk. Powered by Blogger.